Father Hardon’s words remind us of the reflection of our Holy Father upon the secularization of society and culture. The truth is that a great part of so-called Christian nations, in the words of our Holy Father, live as if God did not exist. The secularism and materialism which has so infected the life of society has also entered into the life of the Church. In his Apostolic Letter “At the Close of the Great Jubilee of the Year 2000,” Novo Millennio Ineunte, our Holy Father sets forth the work of the New Evangelization to respond to the loss of faith and the failure to practice the Catholic faith in our time. In response to the great spiritual crisis of our time, the Holy Father proposes simply that we contemplate the Face of Christ Who alone can lead us to salvation. He cautions us against the temptation to seek some new program for the living of our Christian faith, and urges us to turn once again to Christ, in order to know God’s will in our lives and to do faithfully and generously all that God asks of us. He urges us to contemplate the Face of Christ, alive for us in the Church, in her living Tradition. It is clear that Father Hardon saw, with our Holy Father and under the direction of our Holy Father, the urgent need of the New Evangelization. He also saw the way of the New Evangelization which is new faith in Christ and new commitment to live in Christ always and in all things. I mean “new” in the sense that Christ is our all, that we belong completely to Christ, that Christ is King of our lives, purifying and guiding everything we think and say and do. The Marian Catechist Apostolate responds to the call of the Holy Father by forming its members in an ever deeper relationship with Christ through study, prayer and apostolic service. In a true sense, the Marian Catechist Apostolate undertakes the program which our Holy Father proposes for the accomplishment of the New Evangelization: living completely in and for Christ. 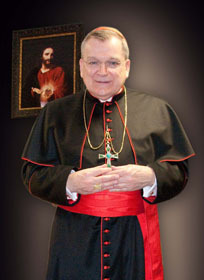 Having set forth the program of the New Evangelization in his Apostolic Letter Novo Millennio Ineunte, our Holy Father gave us, at the beginning of the twenty-fifth year of his service as Vicar of Christ, the Apostolic Letter “On the Most Holy Rosary,” Rosarium Virginis Mariae, the Marian complement to Novo Millennio Ineunte. He describes the Apostolic Letter as “an exhortation to contemplate the face of Christ in union with, and at the school of, his Most Holy Mother.” (No. 3) In fact, to highlight the importance of praying the Holy Rosary in carrying out the New Evangelization and to commemorate the 120th anniversary of Pope Leo XIII’s Encyclical Letter on the Most Holy Rosary Supremi Apostolatus Officio, Pope John Paul II set aside an entire year, from October of 2002 to October of 2003, as the Year of the Rosary. Calling to mind the central place of prayer in the program of the New Evangelization, the Holy Father also reminds us that the “Rosary belongs among the finest and most praiseworthy traditions of Christian contemplation.” 5 Praying the Rosary, we sit at the feet of Mary, in order to gaze with her upon the Face of Christ and become ever more Christlike. Our Holy Father points out that the Rosary, while Marian in character, “is at heart a Christocentric prayer.” (1b) In other words, although the prayer consists of a repetition of the Hail Mary, it centers on the mystery of the Redemptive Incarnation, the mystery of the coming of God the Son in our human flesh in order to free us from sin and everlasting death. Pope Paul VI rightly called the Rosary a compendium of the Gospel, for the mysteries of the Rosary recall the essential moments of our Redemption. With Mary, we reflect upon the events of the Rredemptive Incarnation and, thereby, look upon the face of Christ, as she did from the moment of His Birth to His appearance to her after His Resurrection. Our Holy Father has helped us to contemplate more fully the mystery of God’s love for us in Jesus Christ by giving us an additional five mysteries, the Mysteries of Light or Luminous Mysteries. By the addition of the five Mysteries of Light, the Rosary becomes a more complete reflection of the Gospel, a fuller and richer contemplation of the Face of Christ, our Savior. As our Holy Father rightly observes, Mary, in a certain sense, looked mystically upon the Face of Christ from the moment of His conception in her womb. Before she could see Him, Mary began to devote her attention exclusively to Christ. The Holy Father observes: “No one has ever devoted himself to the contemplation of the face of Christ as faithfully as Mary.” (10) From the moment that her eyes looked upon Christ for the first time at His Birth, she never ceased to look upon Him. She was indeed His first and best disciple. 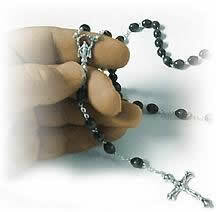 Our Holy Father points out that Mary prayed a kind of Rosary from the time of the Incarnation. She was constantly reflecting upon the mystery of the Redemptive Incarnation in the events of the life of her Son, God the Son, our Redeemer. The Rosary is our way of staying at Mary’s side and gazing upon her Son in the events by which the mystery of God’s love for us in Him unfolded. Looking upon the Face of Christ, at the School of Mary, we hear His invitation to unite our hearts to His Sacred Heart, to unite our lives to His, and, with Mary, we give our fiat to our vocation and mission in Christ, which is daily conversion of life and the transformation of our world into a civilization of divine love. Among the spiritual practices of Marian catechists, the Rosary fittingly comes immediately after participation in the Holy Mass. Through the daily praying of the Holy Rosary, the Marian catechist continues to look upon the Face of Christ contemplated most fully in the Eucharistic mystery. Through participation in the Holy Eucharist and worship of the Most Blessed Sacrament, and the daily praying of the Holy Rosary, Marian catechists remain at the feet of Mary, at her school, coming to know Christ more deeply, in order to serve Him more faithfully. Through the Holy Rosary, Marian catechists reflect upon the mysteries of the faith, into which they introduce those whom they catechize. In their devotion to the Holy Rosary, Marian catechists imitate the saints for whom the Rosary was an altogether special means of growing in holiness of life. Our Holy Father mentions, in particular, Saint Louis Marie Grignion de Montfort who wrote The Secret of the Rosary. It is from the words of the total consecration to Mary, proposed by Saint Louis de Montfort that our Holy Father took the motto for his episcopacy and pontificate, Totus Tuus. Our Holy Father refers, too, to Saint Pio of Pietrelcina’s devotion to the Holy Rosary. He also reminds us of Blessed Bartolo Longo, who worked with Pope Leo XIII at the end of the 19th century, for the building of the Church of Our Lady of the Holy Rosary at Pompei in Italy. The motto of the Marian Catechist Apostolate is the words of our Blessed Mother to the wine stewards at the Wedding Feast of Cana: “Do whatever He tells you.” (Jn 2:5) Marian Catechists seek nothing more than to grow in their knowledge, love and service of Christ, so that others will indeed also come to know Him deeply and to do faithfully what He teaches us in the Church. As International Director of the Marian Catechist Apostolate, I pray that all Marian Catechists will grow especially in their devotion to the praying of the Holy Rosary. May they contemplate the Face of Christ through the Holy Rosary and share generously with others, especially the uncatechized, the fruits of their contemplation.